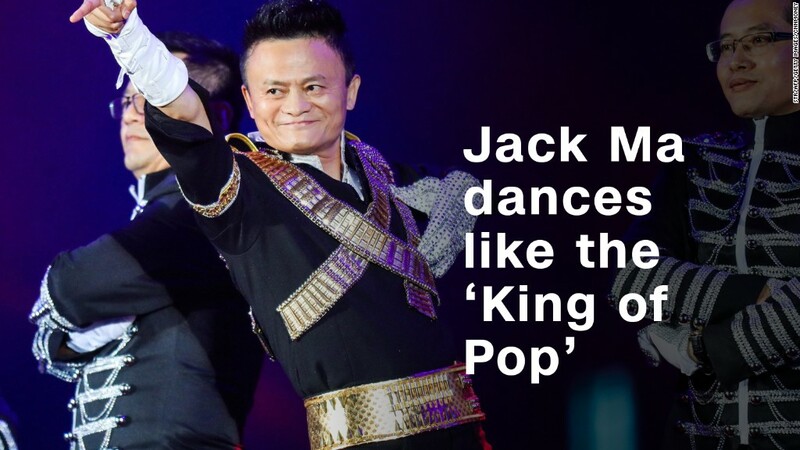 China's king of e-commerce channeling the king of pop. A real estate mogul belting out 80s rock ballads. A tech tycoon banging the drums while dressed in gold. This isn't your typical office party. Annual galas are common at large Chinese firms, especially around the holiday season. But some of the country's biggest companies take corporate soirées to a whole other level. And rather than delivering dry speeches, the leaders of Alibaba (BABA), Baidu (BIDU) and Dalian Wanda Group prefer to put in show-stopping performances. "They are trying to show they are modern and accessible and not your typical dictatorial boss," said James McGregor, chairman of consulting firm Apco Worldwide's greater China division and the author of "One Billion Customers: Lessons from the Front Lines of Doing Business in China." 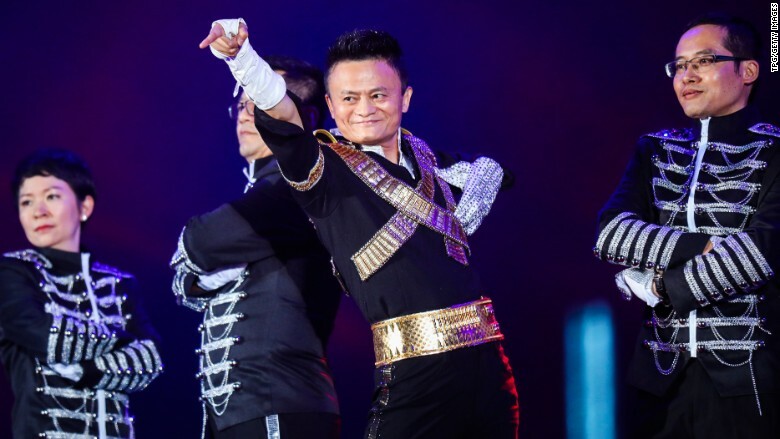 Alibaba's billionaire founder, Jack Ma, dressed up as Michael Jackson last week and performed a choreographed dance solo to "Billie Jean" for thousands of employees and guests to celebrate the company's 18th anniversary. Other employees joined him on stage -- all dressed like MJ circa 1995 -- to dance along to "Dangerous." It ended in a magic trick, with Jack driving a motorcycle into a steel cage from which he later disappeared. Alibaba spokeswoman Cathy Yan said her boss' annual performances are "a routine thing," comparing them to a team-building exercise. Other Alibaba employees also give elaborate performances at the events, which can last for close to four hours. But Ma's are the most highly anticipated. He dressed as a punk rocker and sung the Lion King's "Can You Feel the Love Tonight" at the company's 10th anniversary and has previously performed Chinese songs as well. Robin Li, the founder and CEO of internet giant Baidu, likes to mix things up. He turned his performance at the company's summer party into a family affair this year. His daughter sang "Call Me Maybe" while accompanied by professional dancers. Proud papa, dressed in jeans and a polo shirt, strolled on stage at the end of the song, strumming the last few bars of the song on an acoustic guitar while his daughter crooned along. That performance was understated compared with a 2015 extravaganza, when Li donned a studded gold lamé outfit to sing and play the drums in a dazzling routine -- complete with smoke machines and a laser show -- at the company's annual gala. Many other Chinese business leaders like to put on a show, according to Jeffrey Towson, a private equity investor and professor at Peking University. "You see these kinds of crazy events all the time," he said. The outlandish galas allow bosses to be playful and self deprecating while also demonstrating how successful the company has been, according to Towson. Wang Jianlin, the billionaire chairman of property firm Dalian Wanda, has made headlines by buying up entertainment businesses like AMC Theaters and Hollywood studio Legendary. And he can put on a show himself. Wang has performed traditional Chinese opera and 80s rock ballads at company events. Wanda posted last year's performance on its YouTube channel under the headline "How to take the stage like a boss," boasting about Wang "owning the karaoke stage." But these are more than casual karaoke sessions with colleagues. Wang wears a regular business suit for his performances, but he is accompanied by costumed backup dancers and light shows.